Learn about switch basics, including the pole and throws naming convention, normally open (NO) and normally closed (NC) terminology, different switch topologies, and types of switches such as electromechanical relays, reed relays, solid state relays, and field-effect transistor (FET) switches. A switch is a device that is used to make and break the connection in an electric circuit. A switch can also be called a relay. Although these two terms are often used interchangeably, typically when talking about an individual switch it is referred to as a relay and a switch is a combination of relays. A switch can be a permanent component in a design or an instrument used to help test components on a board. When used as an instrument, there is often additional functionality provided such as a digital multimeter (DMM). When selecting a switch for your application, it is important to understand the different types of switches. A switch has at least two terminals: one for the signal to go in and one for the signal to go out. The poles of a switch are the input terminals; these define how many separate circuits the switch can control. The throws of a switch are the output terminals; these define the number of different output connections each switch pole can connect its input to. A switch is classified by its number of throws and poles. The simplest switch is a single-pole, single-throw (SPST) switch. As the name indicates, it can control one circuit and connect to one output. This switch is either closed or completely disconnected. It is great for applications that need only an on or off state; for this reason, it is the most common form of momentary switch. A momentary switch remains in its closed state only for as long as it is being actuated, such as a push button or a reed switch that opens or closes in the presence of a magnetic field. Figure 1. An SPST switch is ideal for applications that require only an on or off state, such as a momentary switch. A single-pole, double-throw (SPDT) switch routes one input circuit to one of two output circuits. This switch is great for selecting between two options such as power sources or DMMs; it is often called an A/B switch because you can choose from option A or option B. It can also be referred to as a changeover switch. Slide switches are often SPDT. Figure 2. An SPDT switch is great for applications that need two options, such as a slide switch. Although an SPDT switch has two throws, it may have more than two positions. In addition to being connected to the two throws, there might be a center position that does not connect to either output. This is often called a center open switch. A double-pole, double-throw (DPDT) switch has two poles, each of which have two throws. It has six terminals. It can be thought of as two SPDT switches that are always switched together by a single actuator. It is commonly used for phase or polarity reversal by crisscrossing the terminals. Figure 3. A DPDT switch is essentially two SPDT switches that are switched simultaneously, and it is common for phase or polarity reversal. SPST, SPDT, and DPDT switches are the most common; however, you can find switches with more poles or throws. A rotary switch, for instance, tends to have many throws. If you take a look back at Figure 1 of the SPST switch, you can see that the image is of the switch open. This switch is said to be normally open (NO). When you actuate an NO switch, you close the circuit. An SPST NO switch is referred to as form A. Contacts can be referred to as NO when in the open position. The alternative is for a switch to be normally closed (NC). An NC switch’s default state is for the circuit to be connected. An SPST NC switch is referred to as form B. Contacts can be referred to as NC when in the closed position. Figure 4. A switch can be normally open as seen in Figure 1, or normally closed as seen above. The terminals themselves can also use the same terminology. For instance, in Figure 2 of the SPDT switch, the top terminal 1T can be referred to as NC while 2T is referred to as NO. In a DPDT, there are two NC terminals and two NO terminals. Figure 5. Individual terminals can be referred to as NC and NO. SPDT switches have two main forms. A form C switch opens the connection before it closes the other connection; this is referred to as a break before make switch. A form D switch closes both connections before opening the original connection; this is referred to as a make before break switch. Figure 6. Form C and D switches are also known as break before make or make before break switches, respectively. Switch topology is an organization representation of the channels and relays in a switching device. General-purpose topology switches consist of a group of independent switches or multiple SPST, SPDT, or DPDT switches. These are useful when switching high current loads such as power and load switching. 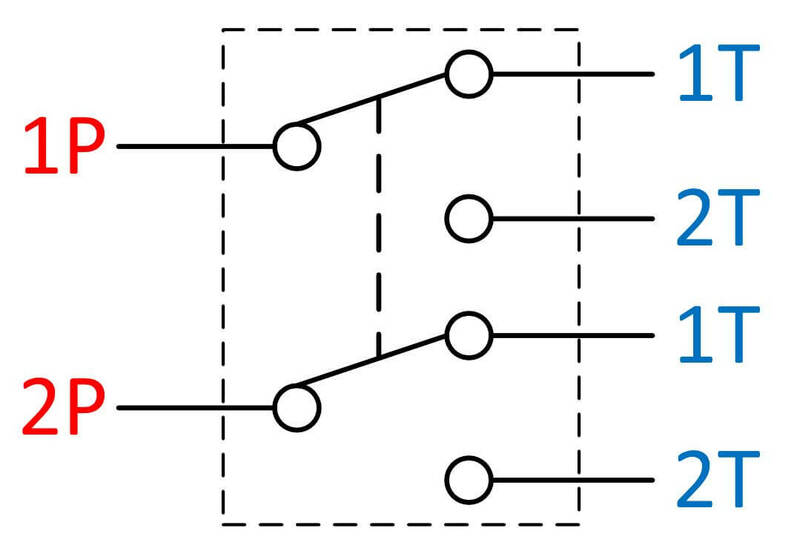 A multiplexer mux is a topology that gives you the ability to connect one input to multiple outputs or the reverse, one output to multiple inputs. It is referred to by the number of inputs to the number of outputs. For instance, a 4:1 or 4 x 1 mux allows you to connect four inputs to one output. This topology is useful when you want an oscilloscope to measure multiple signals or a function generator to course a signal to different points. It can consist of different switch forms, depending on your application needs. Figure 7. A mux gives you the ability to connect multiple inputs to one output or the reverse, and it can be made of different switch forms to meet your application needs. With a matrix topology, you can connect multiple inputs to multiple outputs organized in rows and columns. Connect any column to any number of rows and any row to any number of columns. At each intersection of a row and column, there is a switch. When the switch is closed, the row is connected to the column. Although typically more complex than other topologies, it does provide a lot of flexibility for your application. Figure 8. This 2 x 4 matrix switch gives you the ability to connect multiple inputs to multiple outputs. In addition to understanding the different switch configurations, it is also important to understand the different types of relays. Electromechanical relays are electrically operated switches that rely on mechanical contacts as the switch mechanism. These are also known as armature relays. They are made of coils and contacts. When the coil is energized, the induced magnetic field moves the armature, which opens or closes the contact. Figure 9. Electromechanical relays are electrically operated switches that rely on mechanical contacts as the switch mechanism. Electromechanical relays support a wide range of signal characteristics, from low voltage/current to high voltage/current and from DC to GHz frequencies. For this reason, you can almost always find an electromechanical relay with signal characteristics that match given system requirements. However, the contacts on electromechanical relays tend to be larger and more robust than some other relay types. The larger contacts give them the ability to withstand unexpected surge currents caused by parasitic capacitances present in your circuit, cables, and so on. An unfortunate trade-off, however, is that the larger contacts require larger package sizes. 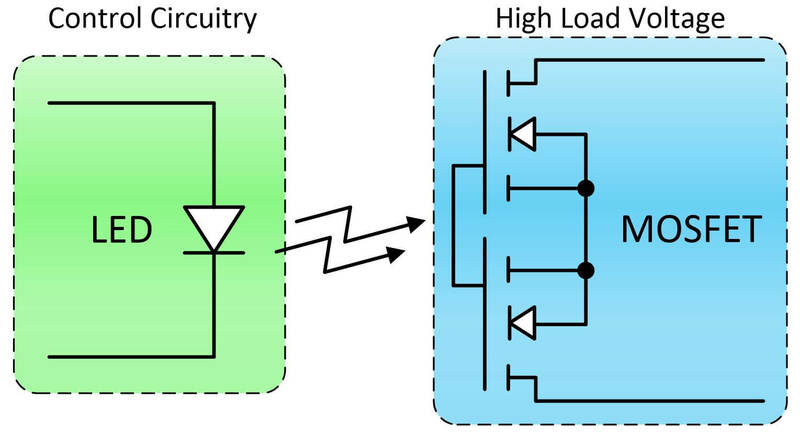 Electromechanical relays posses a mechanical construction that allows for flexibility in switching capability, but they have one important limitation: speed. When compared to other relays, electromechanical relays are relatively slow devices—typical models can switch and settle in 5 to 15 ms. This operating speed may be too slow for some applications. Electromechanical relays typically have a shorter mechanical lifetime than other types. Advances in technology have increased their mechanical lifetime, but electromechanical relays still do not have as many possible actuations as comparable reed relays. As with any relay, the amount of power being switched and other system considerations can have a significant impact on the overall lifetime of the relay. In fact, the mechanical lifetime of an electromechanical relay may be smaller than that of a reed relay, but its electrical lifetime under a similar load (particularly a capacitive load) might decrease at a much slower rate than that of a reed relay. The larger, more robust contacts of an electromechanical relay may often outlast a comparable reed relay. There are two types of electromechanical relays: latching and non-latching. A latching relay maintains its state after being actuated. It has no default position and remains in its last position when the drive current stops flowing. A latching relay has internal magnets that hold the relay once current starts flowing; this reduces energy because once actuated, it requires no current flow to maintain its position. For this reason, a latching relay is useful in applications where power consumption and dissipation must be limited. 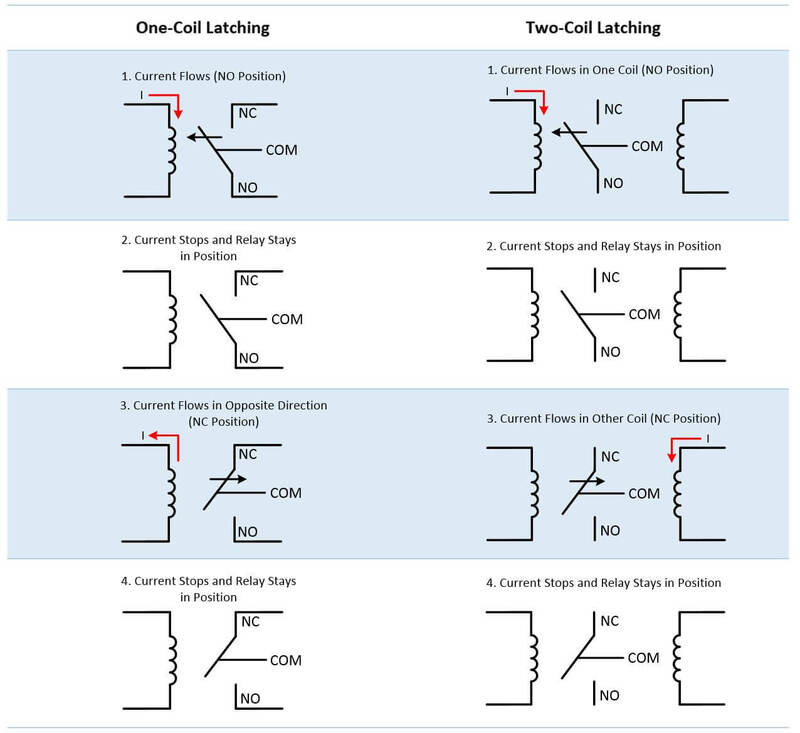 For very low-voltage applications, a latching relay is preferable because the lack of coil heating minimizes thermal electromotive force (EMF), which can affect your measurements. A latching relay can have one or two coils. In one-coil latching, the direction of current flow determines the position of the armature. In two-coil latching, the coil in which the current flows determines the position of the armature. Figure 10. Latching coils stay in position once actuated. In one-coil latching, the direction of the current flow determines the position of the armature. In two-coil latching, it is determined by which coil the current flows through. Conversely, a non-latching relay maintains its state only while being actuated. It has an initial position of NC that is maintained by the force of a spring or permanent magnet while no current flows. The NO contact is maintained by the force of a magnetic field while current flows through the coil. When the current stops, the relay reverts back to its initial NC position. A non-latching electromechanical relay is useful in control applications when the switch must return to a known state if power is lost. It is often used in push button applications such as keyboards or microcontroller input buttons. Reed relays are switches that use electromagnets to control one or more reed switch. Reed relays, like electromechanical relays, have physical contacts that are mechanically actuated to open/close a path. For reed relays, however, the contacts are much smaller and lower mass than those used in electromechanical relays. Dry reed relays are made of coils wrapped around reed switches. 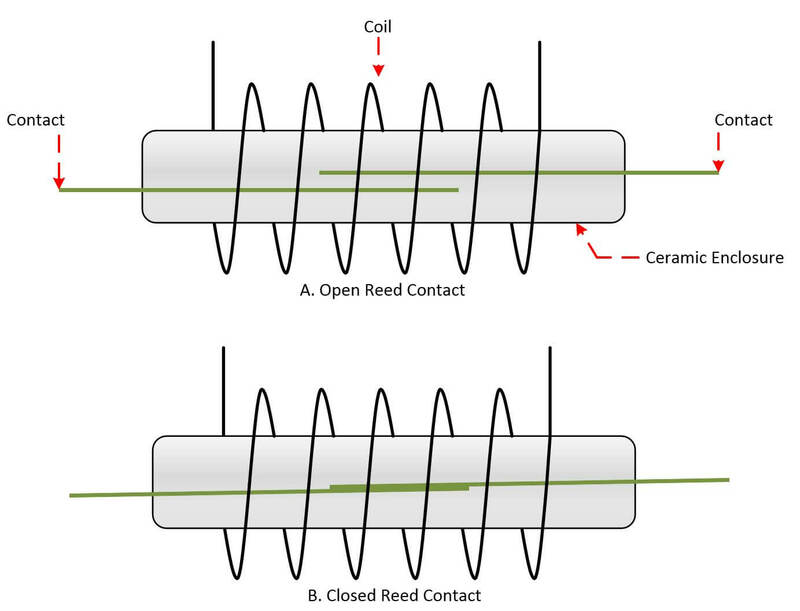 The reed switch is composed of two overlapping ferromagnetic blades (called reeds) hermetically sealed within a glass or ceramic capsule that is filled with an inert gas. The reeds have contacts on their overlapping ends. When the coil is energized, the two reeds are drawn together such that their contacts complete a path through the relay. When the coil is de-energized, the spring force in the reeds pulls the contacts apart. Because the moving parts are small and lightweight, reed relays can switch faster than armature relays and tend to require very little power. However, they are susceptible to damage from arcing. When a spark jumps across the contacts, it can melt a small section of the reed. If the contacts are still closed when the molten section resolidifies, the contacts may weld together. The spring force in the reeds is often insufficient to mechanically break the weld, causing the reeds to stick in the “on” position. Figure 12. 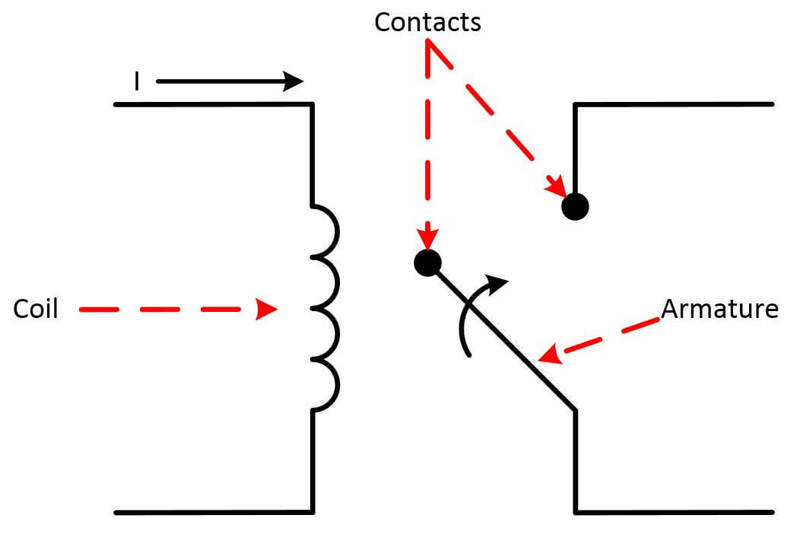 In reed relays, current through the coil creates a magnetic field that draws the two reed contacts together. Because of the smaller, less massive contacts and the different actuating mechanism, reed relays can switch about 10 times faster than electromechanical relays with equivalent ratings. Reed relays also have a much higher mechanical lifetime than electromechanical relays. The trade-off, however, is that the smaller contacts on reed relays make them much more susceptible to damage from arcing when closing a circuit. When an arc jumps across the contacts, it can melt a small section of the contact surface. If the contacts are still closed when the molten section resolidifies, the contacts may weld together. The spring force in the reed is often not sufficient to mechanically break the weld after the drive current has been turned off, which renders the relay unusable. Electromechanical relays may also be damaged from arcing, but the energy required to cause this is much higher. The ferromagnetic material from which reed relays are constructed causes them to have a higher thermal EMF than equivalent electromechanical relays. Reed relays are thus not ideal for extremely low-voltage applications as their thermal EMF may introduce enough noise to cause errors in your measurements. The small size and high-speed of reed relays make them a great choice for many switching applications. Reed relays are more often found on matrix and multiplexer modules than general-purpose modules. Solid state relays (SSRs) are electronic switches that actuate when a small external voltage is applied across their terminals.They consist of a sensor that responds to an input, a solid-state electronic switching device that switches power to the load circuitry, and a coupling mechanism to enable the control signal to activate without mechanical parts. They are often constructed using a photosensitive metal-oxide semiconductor, field-effect transistor (MOSFET) device with an LED to actuate the device. Figure 13. In SSRs, light from the encapsulated LED actuates the photosensitive MOSFET and allows current to flow through it. SSRs are a faster alternative to electromechanical relays because their switching time is dependent on the time required to power the LED on and off—approximately 1 ms and 0.5 ms, respectively. Because there are no mechanical parts, their life expectancy is higher than electromechanical or reed relays. This also makes them less susceptible to physical vibrations. However, the downside is that contact resistance for SSRs is greater because the connection is made via a transistor instead of physical metal like in electromechanical and reed relays. Although technology is continually improving the contact resistance of SSRs, it is still not uncommon to find them in production today with resistances of 100 Ohms or more. SSRs tend to generate very little noise, but they are not as robust as electromechanical relays. Much like reed relays, they are highly susceptible to surge currents and damage when used at signal levels above their rating. Although there are no metal contacts to weld, damage to the MOSFET can render the relays unusable. Lastly, SSRs tend to be more expensive than other switches. They also dissipate more heat. SSRs are useful for high-voltage applications and are common on matrices and multiplexers. FET switches use a series of CMOS transistors to implement the switching. A voltage is applied to control circuitry, which connects the source and drain of a transistor network (load circuit). A switch is a device that is used to make and break the connection in an electric circuit. SPST switches control one circuit and can connect to one output. They are ideal for applications that need only an on or off state. SPDT switches route one input circuit to one of two output circuits. They are ideal for selecting between two options. DPDT switches are like two SPDT switches with a single actuator. They are commonly used for phase or polarity reversal by crisscrossing the terminals. Electromechanical relays are electrically operated switches that rely on mechanical contacts as the switch mechanism. They provide a good all-around solution, although they have limitations in package size, switching speed, and mechanical lifetime. Latching relays maintain their state after being actuated. Non-latching relays maintain their state only while being actuated. Reed relays use electromagnets to control one or more reed switch. They improve on package size, density, and speed but are less robust in situations where surge currents may be present. General-purpose topology switches consist of a group of independent switches, or multiple SPST, SPDT, or DPDT switches. They are useful for high current loads such as power and load switching. A multiplexer or mux is a topology that allows you to connect one input to multiple outputs or the reverse, one output to multiple inputs. A matrix topology allows you to connect multiple inputs to multiple outputs organized in rows and columns, allowing for maximum flexibility. Solid state relays (SSRs) are electronic switches that actuate when a small external voltage is applied across their terminals. SSRs are nice alternatives to mechanical relays but have higher path resistances. FET switches use a series of CMOS transistors to implement the switching. They provide a fast, low-cost solution but have the limitation of working with only low voltages. NO: Normally Open. The circuit will be open until the switch actuator is operated. NC: Normally closed. The circuit will be closed until the switch actuator is operated. Momentary: As soon as the button is released it returns to its previous state. Holding the button down will either make or break the circuit, depending on if you wired the NC or NO contacts. Maintained: Best described as a push/pull action, similar to a light switch. Pushing the button in and it will “maintain” this position until it is pushed again (like a light switch). SPST: single pole, single throw. The switch has only one moving contact and one stationary contact; it is either normally open (NO) or normally closed (NC). SPDT: single pole, double throw. The switch has one moving contact and two stationary contacts (NO & NC); when operated, the contacts reverse states. DP: double pole. It is available in single throw and double throw configurations; it allows for two separate circuits to be opened simultaneously from one switch. SPST-NO: Single pole, single throw, normally open switch keeps circuit A-B open. This could be used in a system with a fail secure device. When the switch is operated, contact closes, completing circuit A-B. Electricity would flow to the device causing it to release. SPST-NC: Single pole, single throw, normally closed switch keeps circuit A-B closed. This could be used in a system with a fail safe device. When the switch is operated, contact opens, breaking the circuit A-B. Electricity would cease to flow to lock, causing it to release. SPDT: Single pole, double throw switch provides a closed circuit, A-B and an open circuit, A-C. This could be used in systems with a fail safe device in circuit A-B and a light in circuit A-C. When the switch is operated, circuit A-B opens, releasing the device and circuit A-C closed, turning the light on. The device and light would have to be rated at the same voltage. DPDT: Double pole, double throw switch provides a set of NO and NC contact for controlling two separate circuits. The swingers of each contact set are mechanically attached together, as indicated by the dotted line (Not to be confused with a Double SPDT, which are independent). Whenever the switch is operated, both contact sets change position simultaneously. When shown on a drawing, the contact set may be drawn in separate locations for convenience. They will be identified as belonging to one switch; that is; the switch may be labeled S1 and the contact sets labeled S1-A and S1-B. Why there is no consideration about selection of switch materials such as: gold contact switches (very low resistance, good for low voltages and currents, but gold cover layer may be displaced by not so high current/voltage sparks) against silver/silver alloy contacts (high voltage and current switch capabilities, but get oxidized if a minimum “wetting” current is not commuted to keep them “clean”).